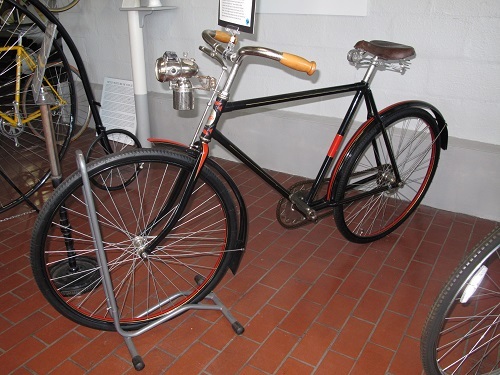 This Czech built Tatra, named after the mountain range and not related to the auto manufacturer, is a good example of an early Safety Bicycle. The chain drive of the Safety Bicycle multiplies the ratio of the pedal revolutions to wheel revolutions, therefore eliminating the need for the large front wheel featured on the High Wheeler. This design has become the golden standard of the bicycle industry as nearly every bicycle is a Safety Bicycle. This TATRA is equipped with a carbide headlamp, which was a popular light source used at the turn of the century for lighthouse beckons, mining work, and vehicle headlights. While these lights fell out of fashion in the US after a 1932 coal mine explosion killed 54 miners in Illinois, they remained popular in many eastern European countries such as the Soviet Union, Ukraine, and Czechoslovakia.